She is also very keen in Reiki, Yoga, Pranayam, Mudra and Crystal therapy, Quantum Touch Therapy ,Angel Therapy which she teaches regularly in the classes. She is totally committed and dedicated to these beautiful healing systems. She has a good command over various languages like English, Hindi, Punjabi and Bengali. Anju also teaches psychic reading development through meditation & relaxation, which includes self-healing & self-awareness. She will balance your negative energies and bring in the positive ones. 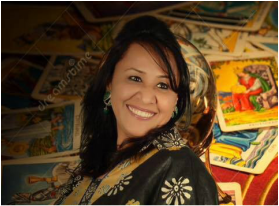 She is a Reiki GrandMaster and had been teaching Reiki, Crystal Healing, Meditation, Tarot Classes, Angel Tarot Cards, Pendulum classes, Quantum Touch Therapy, Since last 8 years and she is perfect in her field. God had been graceful to her in helping her to spread for Humanity.